One of the dirty little secrets about last year's Jets team — one disguised a bit by another quixotic run to the AFC Championship Game — was that the defense wasn't nearly as good as it was the year before. (And, according to Football Outsiders, worse than even the Giants'.) The NFL season so far has been marked by offenses being far ahead of defenses, pretty much on every team. Every team but the Jets, anyway, who F.O. had projected, before yesterday's game against the Raiders, to have the best defensive unit in the league this year, by far. They're probably gonna have to alter those projections. The Jets lost their first game of the season yesterday, 34-24 to the Raiders, and most worrisome was not the loss (though that was really quite worrisome) but the way the Jets' defense was just trampled on the ground. The Jets gave up 234 yards on the ground, the most during the Rex Ryan era, in a way that was humiliating and thorough. The Jets just sort of got stomped on. Actually, that's not quite true. So much of the Jets' defensive prowess is based on being tougher and more resilient than the opponents. Yesterday, Darren McFadden and the Raiders run game saw that toughness and merely scampered around it. The Raiders looked faster, younger and sleeker. The Jets are appropriately concerned. "We didn't come ready to play," Leonhard said. "We got a lot of issues we need to clean up. Right now, we're one for three as a defense. We played one great game and two very poor games. So we got a lot of issues we got to correct ... We have very high standards for ourselves and we came up short two of the three games." Well, one thing to improve on, after watching yesterday: GET FASTER. It really didn't look like the Jets weren't putting forth the effort. They just didn't look as quick as the Raiders. That tells you a lot about the Raiders, who are better than anyone realized. But the Jets are getting older, and the game is changing. It's always possible that the game can zip by. After all, the Bills just put up 34 points (and could have put up more) on a Bill Belichick defense yesterday. The league changes fast. The Jets can just hope to try to keep up. Yesterday, they didn't. Some good news: Mark Sanchez looked terrific, and tougher than his defense. He probably should have scored two rushing touchdowns — he just missed one on replay late, securing the Jets' loss — and LaDainian Tomlinson continues to look light years better than Shonn Greene. And the Pats lost yesterday, so the Jets haven't fallen a game behind them. But with the crazy schedule coming up — a schedule that looks even harder with the emergence of the Bills — the Jets need every win they can corral. 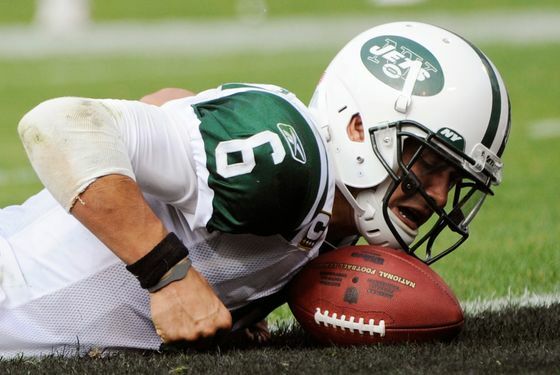 We've always known the Jets were mortal: They come up with one or two games like this a year. But the timing, on this one, it stinks.